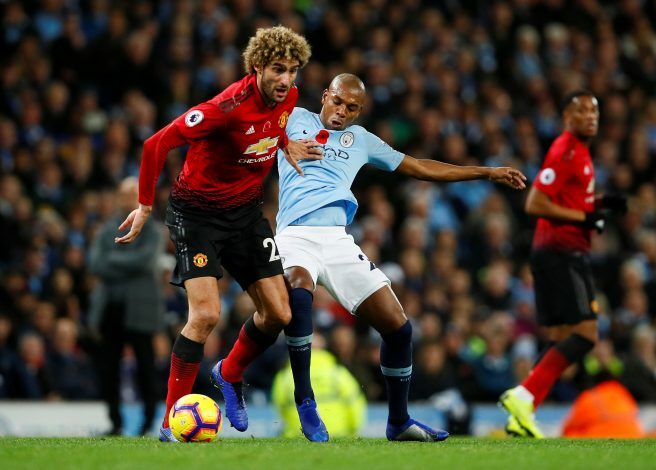 Manchester United fans have lashed out at Fernandinho for a series of tactical fouls committed by the midfielder during Manchester City 3-1 win in the Derby. At the start of this month, the Cityzens were accused of committing smart tactical fouls by former United man and Sky Sports pundit Gary Neville, but that claim was rejected straightaway by Pep Guardiola. The Spanish tactician stated: “We are a team that try to play and, of course, when there is a counterattack sometimes there is contact, the action is a foul but as a team we don’t think about that. “It never happened in Bayern Munich and it can never happen at City; and will never happen in the future in my career. Never,” Guardiola asserted. But within two weeks, the decorated manager appears to have been proven wrong by his own midfielder, as Fernandinho was seen committing several tactical fouls against the Red Devils in the middle of the park on Sunday. The Brazilian was responsible for stopping a number of Manchester United counterattacks through smartly performed challenges, many of which were deemed illegal. But to everyone’s surprise, the player that accumulated enough fouls to get sent off wasn’t even handed a single yellow card by referee Anthony Taylor. Ref very poor, diving, cheating! How has Fernandinho not been booked. Just as poor as Martin Tyler and useless Redknapp did he even play football. A tough game after a tough week of 3 away games. 2/3 wins will take that. United united. Good effort. PL has disgusting referees bro. Not like it'd ve mattered but the fact that Fernandinho committed 3 bookable fouls but never got one yellow card is disturbing.